I am currently editing my interview with Robert on the subject matter, and will post soon after I thoroughly understand it. 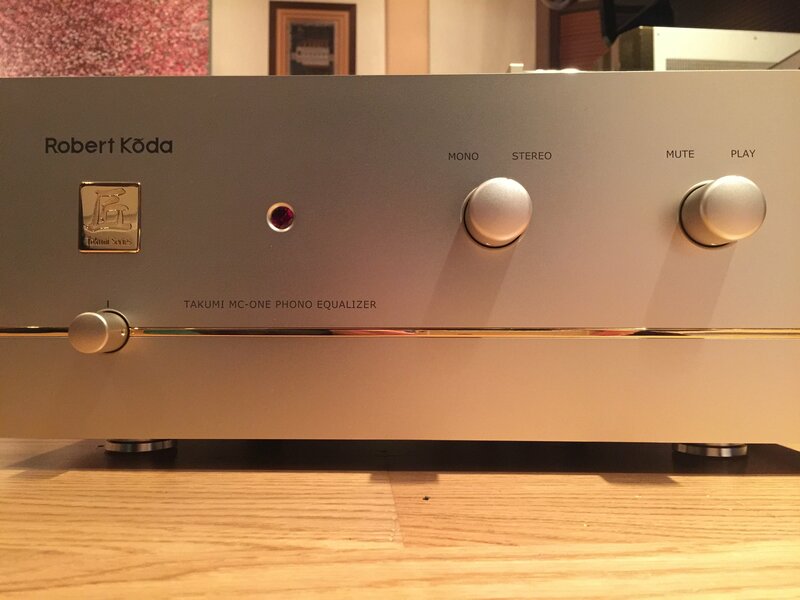 I am Very keen to experience (to be the owner of) this ground-breaking phono. From your initial comment, I am sure this is a master piece. Jinpu, Trinity phono, Wadax Trio...now MC-1, they all represent SOTA in their own school of thought in designing and deploying phono amplification technologies. This is really a shocking announcement before end of 2016. INTERVIEW with ROBERT KODA on the development of Takumi MC ONE. 1. What is wrong with conventional RIAA equalization? There is nothing wrong with RIAA. The challenge is how to apply the reverse equalization as is required. Since the beginning of vinyl, there are only two ways to do it in the analog domain. One is called “passive RIAA” primarily used by many tube electronics manufacturers. Then there is another variation of passive RIAA called “LCR”. Under this approach, the high frequencies are attenuated by 100X at 20khz and 10X at 1khz during the amplification process. This is also known as the “brute force” approach. Another way is the “Active RIAA” approach, which uses tremendous amount of negative feedback in the vicinity of 40db to 60db. For a number of technical reasons, I reject both methodologies. I have successfully developed a new approach. Since I am waiting for patent protection, I would not disclose the technology at this point. 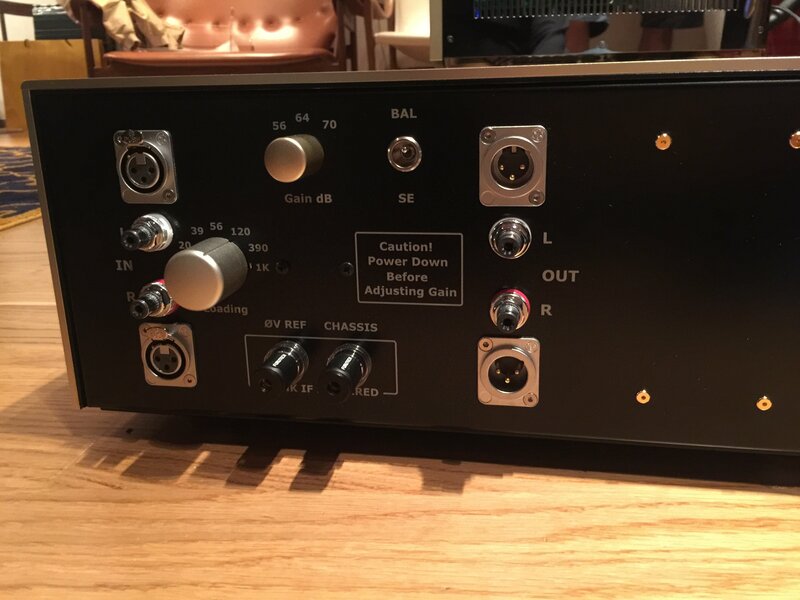 Suffice to say, I do not need to attenuate 20khz by 100 times thereby avoiding many problems. I do not need to use 40-60db of negative feedbacks thereby avoiding another set of problems. 2. Why you are using a single-ended circuit instead of a balance differential circuit to develop the MC One? This is a very technical subject. There are many variables involved. In power amps, the application of single-ended circuitry is rare because maximum efficiency is 25% (K-70 for instance) unless an output transformer is applied. This transformer becomes the main determinant of sound quality. It is difficult to obtain good technical measurements because of massive amount of direct current (DC) flowing thru it. In short, transformers hate DC. Nonetheless, it is also true that a great single ended tube power amp sounds magically wonderful when the right speakers are chosen. At the same time, engineers who prioritize good technical specs prefer balanced circuitry because it cancels out second harmonic distortion. The balanced circuitry also hides noises from power supply. The main building block of balanced circuits is called "the differential amplifier". My approach is to avoid balanced circuitry at all costs. We rather use a "double single ended” topology in the case of MC One and K15EX etc. 3. Why is the internal voltage of MC One much higher than the norm? Yes, 160V is very high for the internal DC voltage in a transistor based phono stage. Vacuum tubes would normally use about 250V and normal transistor pre-amps perhaps around 24V. By using such high voltage, I am able to use design approaches that would not be possible on a 24V supply. In other words it gives me the flexibility to design the way I want rather than a "convenient" way that follows the norm. 4. Did you measure the overall signal to noise level? The actual noise level is best specified as what we call "equivalent input noise" or EIN in short. The lower is the number the better is the sonic result. MC One is about 0.0055 micro volts. In my opinion, EIN matters more than the Signal to Noise ratio (S/N ratio). Unless the noise is objectionably high, otherwise the measurement of S/N ratio does not contribute too much to the overall sound quality. The measurement of a "dynamic noise floor" matters more but this is not easy to measure. 5. What are other unique technical merits of the Takumi MC One? Overloading the Takumi MC one is virtually impossible. If one uses a 0.1mv cartridge, then 14dB more gain is required than a 0.5mV cartridge. Bear in mind that 0.1mv is specified at 1kHz. By 20khz, the output is ten times more. Additionally surface noises alongside dirt/scratches /record wear and tear/stylus resonance are often located around 40khz generating massive ultra sonic energy. If the phono stage is to be overloaded by such, they will penetrate into the audio band thru an inter-modulation process that is detrimental to sound quality. It is pretty much universally known that the avoidance of overloading (especially in the high frequency area where phono stage often falls short) is particularly important. I am lucky enough to be the first AE client to audition this super phono. I totally agree with PT that this is the comparison of Harvard, Cambridge and Oxford. It's about the approach and preferences these grand masters take to design these super phonos, and we can't say which one is an all-winner. To me, I think the most noticeable character of this super phono is, it gives u very very very solid picture of music. If you can hear the silhouette of performers and instruments with the Atlantis and Jinpu, you can hear the 8k image of the performance with MC One. The sound is extremely direct, and yet not a bit harsh. You can identify clearly the position of each instrument in an orchestra. The depth extends far deeper, and all the instruments from the front to the very back are solidly presented. The sounds are very focused that u can feel the singer kneel down and move up when singing. The presentation of mid range when comparing with Jinpu and Atlantis has lesser "moisture" feelings. But it seems this can be dealt with my adjusting gain and change of cables. In a word, this gives you another type of extreme sound you can't experience elsewhere. 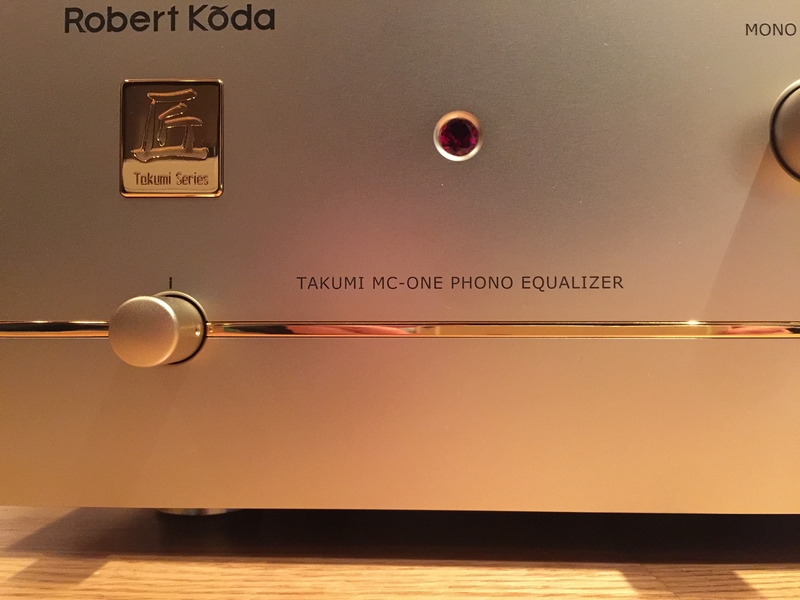 I have a K10, very eager to read about your impressions of this new phono stage from Robert! Can anyone post a pic of the back panel please? I heard that I am lucky enough to be the second one listened to this super phono. Actually, I haven't visit AE showroom for almost half a year. But when I know this super phono is here combo with 宙光+長空，I come right a way next afternoon. Haven't really feel excited for a long time. Cause I somehow have a lot of expectation from this super phono. And the most important thing is, this is the first time to listen a non digital phono in AE. I preferred non digital in vinyl side, as Chris know me well. So invited me to visit him. One more thing, it is paired with a special Madake cartridge. I am lucky that I owned one. Hehehe. So first impression, I asked Chris, what happen to the sound stage in AE, so much improved. Every instrument is accurately located, the volume of each instrument are well rendering, will not overwhelming like before. As I mentioned before in this forum, Horn speaker is not my cup of tea, the attack is too direct for me, eventhough I appreciate the music in AE. He told me the sound stage is from the phono. And I told him this is the first time to feel AE's is not " Showing off" type of music. comfortable. Have taste this time. 好有文化. Like a very humble and well educated musician with very skilled performing in front of me. I listened straight for two hours not feeling tire in AE is something for me. But I told Chris I cannot tell whether this is from Madake or from this super phono. To understand this phono better, I need to install my Madake first. After I listened this two days, I can give a better judgement to this amazing phono. I concurred romanovym's comment. This phono has a very accurate sound stage and the positioning of the instruments is very exact. Nothing added nor deduced. But very accurate and no error type of rendering the music. Give distance and separation to every instruments. I am using Lyra connoisseur 4.3 at the moment. So I compared both. MC one gives more accurate and rendering the music with very define manner than mine. This is what a phono should do, what else we can ask for. Very well done. As my expectation, this is the best phono so far I know. Please make appointment to visit. A very different AE sound as we know before. The 文化 part actually from Madake. I will write another review on it later. Still in the process of loosing up the cartridge. Nice Phono Stage Robert Koda is presenting here. Interesting design and I'm courious what JFets hese using with his 160V DC-voltage... looking to the PCB maybe he means that the 160V is used for the output transistors (which makes more sense). Never found a JFet for phono which owns a GD-breakdown-voltage larger than 40V. Maybe I'm wrong and then I lift my hat :-) But as mentioned, cool design. I use a transformer coupled JFet-Phono with LCR-RIAA and a voltage gain - for MM-cartridges - around 52dB. For MC an Step-up-transformer is used. Robert's MC One conveys music on the vinyl media in a very direct manner. Energy reaches you. Transient responses captivate you. Spatial energy engulfs you. It is not the "soulful mid range" type. I have to repeat the sound is very direct and therefore natural. It has a lot to do with his work on the special equalisation curve. I hear so much energy and attack (including the high frequency attack). The overall experience is very lively. Vinyl playback, in my humble view, is full of distortions. Regardless of how expensive and meticulously built a cartridge is made of, it is hand built like all the exotic watches and each and every cartridge made would have a, however slightest, difference from the other one. Whilst I have no doubt that the precision of some super exotic cartridges can attain the same or even higher level than those watches, the gradual deterioration of the precision will nonetheless surface over time when the cartridge is mechanically in contact with the vinyl records with 2 or 3 equilibrium points including the tonearm. In my limited knowledge on physics, the stress on the tip of the cartridge is enormous while serving the purpose of the collecting the recorded signal on the imbalanced left and right sides of the grooves. According to some research, the distortion on vinyl playback starts at 2khz across the frequency spectrum compared to CD playback. Phonostage amplification is another source of distortion when the signal picked up will be amplified 1000 times. RIAA curves adjustment is all about an attempt to rectify such distortion at this amplification stage in the analog domain. Javier of Wadax has addressed such adjustment in the digital domain with flying colors. Dietmar, under the published international RIAA standards, has also achieved a technological height in distortion mitigation. I read several times the interview summary in this thread and tried to seek more details from PT on what are those ‘patent-to-be’ technological breakthrough leading to the invention of MC-1? The phrase, ‘Active RIAA equilization’ keeps haunting me for weeks until last weekend when I visited to the AE showroom. Obviously it is still haunting me from a technical explanation standpoint, however the resulting performance that MC-1 delivers is unanimously clear to me. I guess I don’t have to repeat the comments that other fellow AE members have shared in this thread which I cannot agree more on every single one of them. 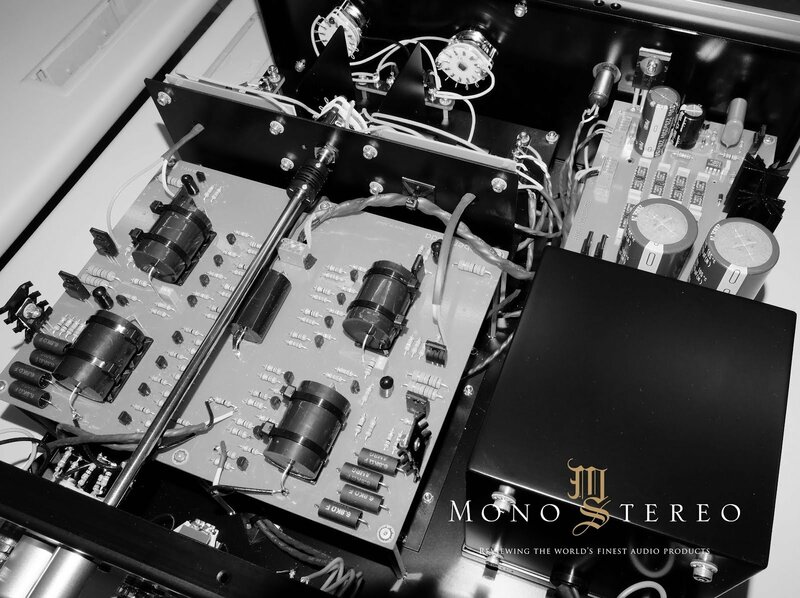 What MC-1 makes a difference to me is that it makes me feel all my previous phono experience has an explicit process of ‘equalization’ with some level of compromise leading to colorations of all sort, but obviously to different extents thus determining the characters of the playback. MC-1 is so transparent and un-characteristic that one can experience a closer reach of the truest musical articulations molded on the grooves of the vinyl records. Are there still distortions on vinyl playback? Yes indeed. Is it a big ‘Yes’ under the signal transmission via the Madeke Snakewood cartridge, Vertere Reference tonearm on Stage 1 vibration platform on SRA Craz rack going thru MC-1, I doubt it even under the strictest measurement in Dietmar’s laboratory! Robert, my salute to you on a great product delivered! Look forward to learning more about the creative breakthrough that you have made! I learnt from PT that you have reserved the serial 001 for Marvel. Thank you! The MC-One has brought great pleasure to my wife and I as we explore music together every night. But this is only half the pleasure! Knowing this work is being enjoyed in other homes across the world is invigorating and intensely rewarding. Your comments, reviews and deep understanding of the art of music and audio are greatly appreciated.